The Fuse "launch" trailer is now live. The game doesn't come out for like a week and a half so that's... weird. Why do I have the feeling there's going to be another trailer? The video offers a sliver of back story and features the prerequisite cool weapon footage and an abundance of explosions, faceless bad guys, and exploding faceless bad guys. I know, I know, it's still not Overstrike, but it looks like it has potential to be a pretty decent squad-based shooter. The cooperative third person shooter recently launched a demo. I played through the quick mission all on my lonesome and I was thoroughly underwhelmed. It didn't help that the demo took place in a snow level. I detest snow levels. It also didn't help that the friendly AI was average (abhorrent when compared to live players) and the enemy AI was made up of battle-hardened experts. On normal difficulty the Raven soldiers flanked my position, intelligently used grenades, healed each other, and sniped with precision. You know how most games give you a warning shot when a sniper is gunning for you? Yeah, these guys didn't get the message. If you see a laser sight on your position while out in the open you are already dead. Switching control of the characters on the fly was interesting, but not very effective, especially since it's game over if even one of your squad members bleeds out before being revived. I decided to take another stab at the demo with a co-op partner. I'm happy to say Fuse is exponentially better with another player. One co-op session later and my attitude had changed from "pass" to "play." Locke and I shot our way through the demo and captured the session for your viewing pleasure. Once we finally figured out how to work together we had a blast. The Fuse-powered Xenotech weapons were impressive on their own and completely badass when used cooperatively. Enjoy. Thanks to Locke Vincent for video editing. Fuse is shaping up to be another challenging and rewarding cooperative title from Insomniac Games. The short demo did an excellent job of showing off how co-op is the key to victory. I do not recommend playing alone. Fuse supports two player local co-op, four player online co-op, and combo co-op. 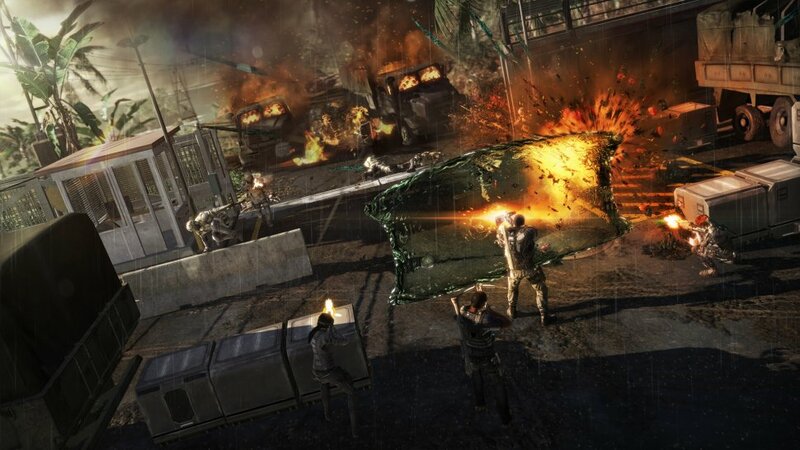 The demo supports all three co-op modes, as well. I encourage you to play it with friends. Fuse will laucnh on May 28th on the Xbox 360 and PlayStation 3.